Last December I was at the Johor Baru Chinese Heritage Museum with members of the Tan Hiok Nee Heritage Walk committee for an event with Johor Tourism which ended with a tour of this road to look at old businesses and new attractions. This was where I met a group of artists who are putting their creative minds together to transform a number of old shops into something exciting in the heart of old Johor Baru. The project was spearheaded by Art Director Yap Leong and one of his colleagues, artist Yeo Si Guan showed us visuals with the artist’s impressions of their plans. Yap, who is also a member of the Tan Hiok Nee Heritage Walk committee, saw the potential in the old shops and gathered his artist friends together to create something special to preserve culture and heritage through their art. They have taken over seven (7) units of old shops at the top of Jalan Trus that also enjoys road frontage at Jalan Ibrahim and Jalan Tan Hiok Nee, to develop Eh He (colloquially pronounced: Uh Huh) – Earth Heart, a destination where art and heritage meets! I was at Tan Hiok Nee Heritage Walk again in mid January and my friends and I couldn’t resist the invitation from Yap to have a peep at what was happening with the renovations in progress. It was twilight and fast getting dark so he reminded me to be careful as I climbed up the rear stairs – a relic they have preserved – and when I saw what they have done (thus far!) I was blown away! The upstairs was designed into a café and gallery dubbed, The Classic Accents Art House, a space dedicated to showcasing the work of homegrown artists. The space was created above two shop-lots and I saw how the entire floor was reinforced and replaced by new floorboards. The old planks were then creatively reused as walls and some were transformed into pieces of furniture. The concrete wall that divides the two shop-lots upstairs is an architectural feature, also carefully preserved and deliberately kept visible through a fiberglass roof to show how local builders adopted this typically Teochew building style. While this is a Chinese building concept, I was told that this style was more prevalent in the Teochew province in China. The wall between each unit peaks higher than the building itself because it is a safety feature that acts as a protection against fire hazards in rows of buildings. The workmen were just closing up for the day but even in the fading light, I spied various pieces of old furniture and fittings that simply reek of nostalgia and I had a flashback to childhood days when I was living in our grandparents’ house. The wooden meat-safe (cupboard) had its twin sagging doors thrown open, the ceramic pots for brewing evil-smelling herbal portions (that was supposed to be good for me! ), the little transistor radio like the one Ah Kong (grandfather) used to listen to news and Teochew opera, and a collection of chamber pots complete with their solid wooden stands! A traditional chamber pot I spotted there! I knew I was coming back to this place again just to see what Yap and his team was doing to give new life to an old building. This is a familiar row of little shops because my dad’s Indian barber, mum’s hairdresser and our favourite florist were just opposite and Eh He was once occupied by traders in electrical items, fabrics and a (dusty) book shop where my sisters and I often visited to borrow and buy second-hand books and novels. In the 70s, there was also a cool shop upstairs for Hallmark greeting cards, gifts and small knick-knacks. When Yap invited me over for a preview last Saturday, I jumped at the opportunity. I stood across the zebra-crossing on Jalan Ibrahim, waiting for the traffic lights to turn Green, and had a good look at the façade. I was struck by the nostalgic design that sported bold radiating rays from the sun painted in the centre of the entire top wall with a similar design on both the pillars downstairs. The name “Eh He” in Red capitals was fitted with bulbs that I was sure would light up by night and from the clever play of colours in the lettering for “earth heart,” the word “art” clearly stood out in Red. Later I learnt that this vintage concept was inspired by the New World Amusement Park, one of the three amusement parks in Singapore that were popular between the 1920s and the 1960s. The moment I stepped across the threshold, my nostrils were assailed by the delicious aroma of freshly brewing coffee. 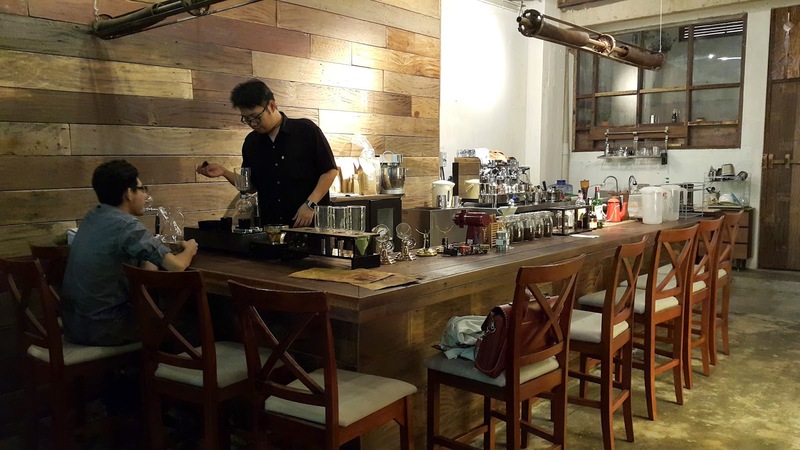 The Ink Brew by Just Want Coffee is the only place in the city where coffee connoisseurs can savour the taste of designer coffee specially created by Nelson Lai for The Ink Brew at Eh He. 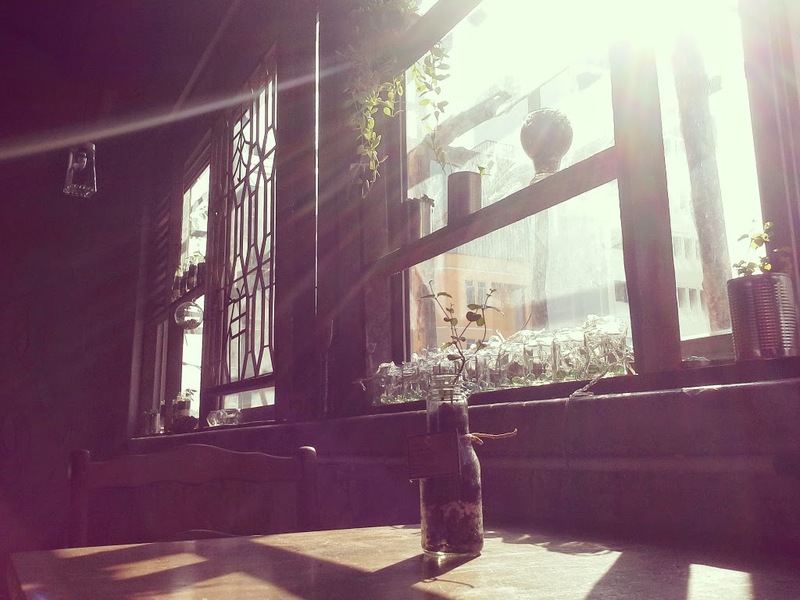 Lai, who has established a reputation for quality coffee in JB, really needs no introduction. But the most interesting morsel I learnt about him that day was that his grandfather used to live at Jalan Ngee Heng (in one of the shops) adjacent to my Ah Kong’s house at No.154! My hand felt the smooth wooden banister as I climbed the ancient staircase and I saw that part of the floor at the foot of the stairs was still covered by original mosaic tiles. At the top of the stairs, my eyes were riveted to the gigantic wall mural and it took a while for me to take in the sight of birds and other creatures around the figure of a little girl (dressed in Red) who is holding mythical whales attached to vines clasped in her hands. Pauline See told me she took more than two weeks to complete the mural that expresses the artists’ desire for freedom to pursue their dreams. She is no stranger to such major projects as her painting of the JB Chingay with the JB Ancient Temple as a backdrop, clinched the top prize (mixed media) in the Tanjong Heritage 2013 national art competition. Natural light streaming through glass panels bathed the interior with mellow shades and created shadows against the wooden furniture and walls. After Yap welcomed me, he showed me the metal window grille that was salvaged from a nearby former textile shop. It had their trade name, Thai Siang designed within in Chinese characters. He said Eh He was collaborating with popular Chinese radio personality and performing artiste, Chong Keat Aun, (Mandarin pronunciation: Chang Chi Aun) to showcase a collection of cultural artifacts in The Classic Accents Art House. In Chinese this auspicious name reads as, Ji An Tai Xiang. The enticing aroma of coffee beckoned and we went to The Ink Brew downstairs where I was introduced to three designer coffees aptly named after the pride of JB heritage: pioneer kangchu Tan Hiok Nee, JB Chingay our national heritage and the 24 Festive Drums. Each of these coffees was meticulously created by Nelson Lai for The Ink Brew and it was my privilege and great pleasure to have my brew of Tan Hiok Nee personally served by him. Created with a blend of Liberica and Columbian beans, this siphon-brewed beverage is topped with a slice of caramelized orange and garnished by a dollop of icing sugar laced with essence of lime with licorice. To best appreciate this brew, I followed Lai’s instruction to begin by melting the citrus-flavoured icing sugar on my tongue. Just as he promised, the first taste evoked nostalgic childhood memories. Then I gently lifted the orange slice off the cup and took a bite before dunking the rest inside the hot brew. As I sipped and savoured my cup of Tan Hiok Nee, I privately wondered if this kangchu and Major China of Johor ever thought that one day his memory would be honoured by a designer coffee named after him! Eh He will be officially opened in a simple ceremony on February 1 and is poised to become an exciting destination in the heart of JB. Visitors to The Classic Accents Art House can immerse themselves in culture and heritage as they enjoy the priceless exhibits. They will also thrill to the treat of seeing JB through the artistic eyes of Chong Keat Aun in an interesting collection of photographs he composed. Eh He is at No. 1, 2, 3, 4, 5, 6, 7, Jalan Trus, Johor Baru, Johor. Open daily from 12pm to 11pm. Tadao Takei was an art teacher for the past 30 years and taught students from elementary to junior high school in Tokyo, Japan. In our local context, his students would be those in primary and secondary school. Painting started as a hobby but he enjoyed it so much that it became his profession. His preferred media is oil paint and he enjoys capturing landscapes and scenery that portrays the four seasons in Japan. Over the years, Tadao created a collection of paintings and would hold solo and group exhibitions annually. His work was bought by private collectors, companies and restaurants. Besides oil painting, Tadao also has a gift in the art of calligraphy. He successfully completed commissioned work in calligraphy for various companies in Japan and now his calligraphic art adorns wine labels, menus and signboards. Two years ago, Tadao and his family relocated to Johor Baru for his son’s education. This is his first time in Malaysia and he will get better acquainted with the local lifestyle before he explores more of the country for inspiration to paint. While the landscape here is tropical and different from Japan, he feels energized by the vast amount of greenery around. Tan Seong Choon discovered a hobby in carving avocado seeds when he carved a seed with his sushi knife during a break after serving customers at the sushi bar. Avocadoes are a key ingredient in California Rolls and other maki or rolled sushi in Japanese cuisine and this is how Seong Choon, now an executive chef with a Japanese restaurant, have access to avocado seeds. The interesting results from carving a face into the first seed led him to carve more seeds and over the years, he has over 300 intricately carved seeds in his collection. His interest in wood carving sparked off back in 1995 when he found a short length of wood from a delivery box and carved it into a figurine. He would carve on any available piece of wood including a broken wooden broomstick from the restaurant before he discovered the joys of carving on avocado seeds. On a morning walk with his wife at the Pelangi Indah Park, they discovered that seeds from the shady millettia pinnata tree were also suitable for carving. His wife, Ann, who is his most ardent supporter, has a room in their home specially set aside to display her husband’s art. Customers at the restaurant where Seong Choon works are among the first people to admire his skillful carvings on avocado seeds. No two designs are alike as each seed is mounted on an interesting base of wood, stone, fruit skin or bark. Last November, a collection of his art was showcased at a public event and when an artist friend saw them, he encouraged Seong Choon to exhibit again. His youngest daughter often encourages Seong Choon to carve popular characters like this! His art is presented as Hui Yi (Carving) Art in an exhibition held at the White Box, on level 4 of Danga City Mall, now on till January 31. Sometimes event organizers happen to choose the same day for their events and Friday, Jan 16 was one of those days when I had four events to attend back-to-back that day. It’s when I have to switch gears from one subject to another and over the years I’ve come to deal with it as all-in-a-day’s-work. Small but important events that day gave me the challenge to plan my itinerary to be on time at each event and not forget to factor in travel time between places as far as Le Grandeur Hotel in Senai to the Renaissance Johor Baru Hotel in Bandar Baru Permas Jaya and then to DoubleTree by Hilton Hotel in Johor Baru before going back to Renaissance JB. I explained to my hosts at Renaissance JB that I don’t want to miss the JB-Tokyo Para Art Exchange 2015 at the DoubleTree by Hilton JB in the afternoon and they graciously accommodated my request by adjusting our time together. This was a unique exhibition of art work by visiting para-artists from Japan along with JB’s own gifted special artist, Yap Hanzhen. I have been part of this young artist’s journey since he started to exhibit his sketches back in 2011 and supported him through the years as he gained more recognition for his art, both locally and abroad. When he participated in the Asia Para Art competition in 2013, Hanzhen’s sketch of the historical Cheng Hoon Teng Temple in Malacca was one of the winning entries selected from among a pool of 1000 entries in Japan. His success earned him a special invitation to Asia Para Art 2013 held in Tokyo in October 2013 and a spot in a travelling exhibition to various airport locations in Japan. At age 16, Hanzhen has held more than 20 exhibitions in various locations around JB, Singapore and Tokyo. Last year his sketch of Meiji Jingu, a shrine in Shibuya, Tokyo, was exhibited at the Japan Tottori Para Art Exhibition 2014, an international art show held at Tottori Prefecture Art Space Gallery until Sept 21. The JB-Tokyo Para Art Exchange 2015 held from Jan 16 – 18 at the DoubleTree by Hilton JB, presented six Japanese para-artists with the opportunity to visit Hanzhen’s hometown and showcase some of their art. It was a cross-cultural art exchange between Hanzhen and ParaArt of Nippon Charity Kyokai Foundation in Tokyo, aimed to explore and share knowledge on the development of art as a future income for disabled people. More importantly, it is hoped that such an art exchange will raise awareness that will elevate the standard and change the perception of art by the disabled in both cities. This sketch is the favourite of Hanzhen's mother! I was honoured to be among the guests at the exhibition where Hanzhen would officially launch his latest book, a project by Daiman Landmark Hotel Sdn Bhd for DoubleTree by Hilton JB, entitled “Johor Bahru – My City, My Heritage,” a sketch book of historical buildings in Johor Bahru. Hanzhen’s unique style in sketching received much support from the Daiman Group who commissioned him to complete an extensive series of 101 sketches that now decorate the lobby and restaurants of the DoubleTree by Hilton JB. I arrived at Axis Lounge in the lobby of DoubleTree by Hilton JB to see many guests already there and heard live keyboard music which I correctly guessed, was being played by Hanzhen. His mother, Yvonne, warmly welcomed me and said how glad she was that I will not miss Hanzhen’s speech. Hanzhen is special and it must have taken a bit of effort to coach him to present a speech. Later on, I understood why she said that. The Japanese visitors must have felt quite at home because I recognised several familiar Japanese people from the JB Japanese community among them. The chairman of the Japanese delegation expressed their deep appreciation for this event which gave international exposure to para art. She said it was not easy for people to understand how para artists relate to their art because to them, art was as important as life itself. Japan has more than 50 years of para art activities organised to promote peace and harmony among nations and it is their privilege to introduce this concept to the world. General Manager of DoubleTree by Hilton JB, Simon McGrath, invited guests to enjoy more of Hanzhen’s art displayed in the hotel lobby, banquet spaces and at Tosca, the Italian trattoria on the 11th floor. Referring to Hanzhen’s book, “Johor Bahru – My City, My Heritage,” he said that DoubleTree by Hilton is committed to promoting heritage areas in the city, particularly to preserve old buildings that are fast disappearing. He expressed his pleasure in how the 30 sketches are a beautiful record of heritage buildings in JB and they come with a map for visitors to explore and experience the heart and soul of this city. When it was Hanzhen’s turn to give his speech, there was ripple of excitement as the audience and members of the media pointed their cameras on him. Hanzhen was quite oblivious of the attention probably because his eyes were focused to the small screen of a mobile phone, which he held up to read his speech. This savant autistic teenager garnered much admiration as he read out what was written, word for word, first with a brief introduction of himself followed by each item which was numbered point by point. His voice rang out clearly probably because the entire audience was listening attentively and the only sounds heard were the soft clicks from the cameras. When Hanzhen introduced his book, guests discovered that they have each received a complimentary copy in the door gift. I’m listening to his speech that was drawing to an end and was pleasantly surprised when Hanzhen read out, “I want to say thank you to Peggy,” before saying thank you also to the Daiman Group who sponsored the publishing of his book! A queue of people waiting for their book to be signed! I’m sure many in the audience may not understand why he said that or who he meant but I was deeply touched that Hanzhen and his family publicly acknowledged me at the launch of his book. Hanzhen and his family have already shown their appreciation for my contribution to his career by presenting me with a specially drawn piece entitled, “Simply Butterflies!” It was truly a lovely gesture. I found out later that the speech was written by Hanzhen’s father, Yap Yew Peng. He told me he can clearly recall that day when we met at the event in Leisure Farm back in 2011, the bench where we sat down for a chat and the conversation we had about Hanzhen’s gift in drawing. My signed copy where Hanzhen also wrote my name! Yap recalled that at that time, Hanzhen had just started drawing and his subjects were small animals like dogs, cats and birds. Yap and Yvonne are familiar with My Johor Stories and my interest in local art, culture and heritage. When I encouraged Hanzhen to start sketching images of JB’s old buildings to preserve their architectural beauty for posterity, they were excited about it. It was a new challenge for Hanzhen to move from drawing animals and small creatures to buildings and as the Yaps are architects by profession, heritage buildings certainly appealed to them. It was sweet to reminisce about how the idea was mooted and I couldn’t help feeling a deep sense of satisfaction to see his sketches compiled in a book for locals and visitors to appreciate and enjoy. The event aptly ended with a book-signing session where his father stood proudly by Hanzhen as he signed book after book for happy owners of his book on JB heritage buildings. Last August while travelling to the UK for my nephew’s wedding, I was delighted to discover that Pages 76 to 81 of Going Places, the Malaysia Airlines’ in-flight magazine, was devoted to a feature on Johor Baru’s Jalan Tan Hiok Nee entitled, “JB Cool.” It warmed my heart that our very own JB was truly “going places” and gaining exposure among international travellers on board our national carrier. As I scanned the photos with the feature, I recognised the faces and places because I’m familiar with the merchants who are injecting new life into the heart of JB with their new businesses in old buildings. I didn’t think it was wrong for me to feel a prickle of pride because this charming part of JB that I frequent to introduce its uniqueness to my visitors, was being featured in this prestigious magazine. 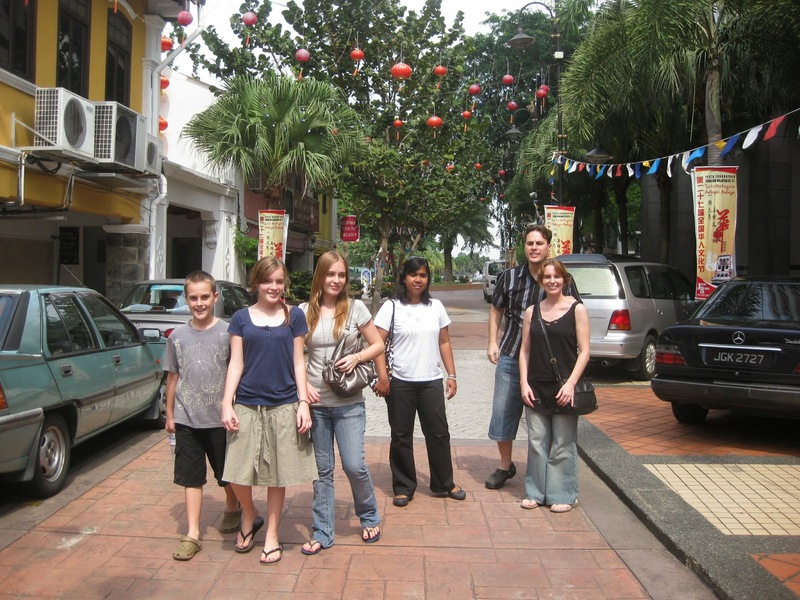 Since Jalan Tan Hiok Nee was declared a Heritage Walk in 2009, the network of nearby roads that link Jalan Trus and Jalan Dhoby have been developing into a popular destination for locals and tourists. With weekend cultural events and daily night markets in the adjacent Bazaar JB, this area is drawing in throngs of people. Then two arches at each end of Jalan Tan Hiok Nee, one near OCBC Bank and the other opposite HSBC Bank, were built as landmarks for visitors to identify this heritage destination. As the twin arches complimented the roads which were already paved, the heritage identity of this area attracted self-motivated young people to start businesses here. It organically developed into an exciting community with traditional businesses like tailors, dhobis, kopitiams and bakeries thriving alongside specialty coffee cafes, a pop-up cafe, chic boutiques, art galleries, antique dealers and an established corner café renowned for its chicken chop! because the pavements were blocked by cars! While the aim of creating a destination to bring life back into the old part of the city is being met, some situations have arisen that were probably not anticipated and if they go unresolved, I’m concerned that this destination will no longer be attractive. Recently, the JB Bazaar started to occupy a wider area with more stalls mushrooming next to registered traders. Now the rampant illegal parking by businessmen and other drivers along the paved streets have destroyed the pavements and created potential traffic and fire hazards. A larger bazaar also resulted in more vehicles belonging to traders and shoppers choking up the heart of the city, especially in the evenings. The Johor Baru City Council (MBJB) recently held a “Go Green” event with a recycling campaign, music festival and a Vehicle-Free Day in some parts of the city. Going Vehicle-Free is an excellent idea that should be adopted permanently for visitors to enjoy the sights with walking tours in the city. For a start, I humbly suggest to gazette Tan Hiok Nee Heritage Walk as a “Strictly No Parking Zone” so that the pavements are freed up for pedestrians and traders to do more to promote JB’s culture and heritage. This one-way street should allow vehicle drive-through only while business owners and traders who show proof of their business addresses here, should be offered a low flat rate for season parking in the car-park at nearby Jalan Ibrahim. At the moment, the information centre at Laman Sri Lanang seems to be underutilized even though it was designed for ambitious purposes. This building should be properly manned by trained personnel to provide information and any emergency help. The visible presence of Tourist Police will be deterrents to petty criminals and the Police may also double up as Courtesy Ambassadors to answer any queries and equipped to be a “Walking Directory” to help visitors with directions to places of interest and the nearest hospital or Police Station, if the need arises. Recently I was at Jalan Tan Hiok Nee with visitors from the Johor Tourism Department and also met several businessmen who lamented about the problems they faced after the nightly crowds leave at the close of business. I regret to learn that they not only leave a trail of garbage in their wake but also a stinky stench from stale urine. We know that everyone has to answer the call of Nature and it appears that in the dark of night, people have been using the street as their toilet! Cleanliness and security are vital to making a destination attractive to visitors. But the sad truth is how this popular destination does not have any public toilets and those that were available for visitors in shops will be closed after business hours. This toilet issue is only the tip of the proverbial iceberg because a great deal more needs to be done to make our city ready to welcome visitors. Tourist Information Centre that is virtually always closed! We urgently need a concerted effort by the relevant authorities to work in cooperation with the MBJB, Tourism Department, Police and Traffic Police as well as the committed participation of every individual who is proud of JB as our home, because it will go a long way to improve the image of our city. The start of 2015 is a good time to reflect on the past and take stock of our successes and failures so that we can do better in the future. So let’s begin, if possible, with better law enforcement with “No Parking on Pavements” at Jalan Tan Hiok Nee, proper parking in designated areas and more rubbish bins so that the public have no excuse for littering. The time is ripe for us to do something constructive to improve the situation so that visitors, whether local or foreign, will take home a positive impression of Johor Baru. If you are familiar with the authentic taste of Indian cuisine at 7 Spice Restaurant, then you will be delighted with similar standards of quality in the food served at Spice Grill, the restaurant group’s newest outlet now open at The Little Red Cube, Puteri Harbour. With six years experience in serving homemade flavours for North and South Indian recipes to regulars and even the royal family, the restaurant owners have created a fine-dine restaurant to please a discerning clientele. At Spice Grill, diners will be spoilt for choice as they may select from two menus for traditional Indian cuisine as well as Western food. Step into the lobby and you will come face-to-face with portraits of renowned personalities like Mother Theresa, Nelson Mandela, Mahatma Gandhi and Bapa Malaysia, Tunku Abdul Rahman, for some inspiration in their quoted words. Created in a corner unit in The Little Red Cube, Spice Grill has an elegant dining hall, private dining rooms as well as a comfortable outdoor section with a balcony that overlooks the promenade and Puteri Harbour. When you are comfortably seated, take a closer look at the elegant ambiance and you will see the restaurant’s insignia, “SG,” repeated on the table linen, cutlery and crockery. You don’t have to be overwhelmed by the big menus and the Tamil words for food names in the Indian cuisine menu because there are brief descriptions in English and their helpful managers and waiters are on hand to answer your queries and suggest recommendations. The Indian cuisine menu, with vegetarian and non-vegetarian items, is also marked with icons like a chef’s hat for chef’s recommendations and one or two red chillies to indicate the spicy hotness of certain dishes. One of the plus points about dining here is how diners at the same table may pick food from one or both menus and savour a mixed menu in one meal! Diners who do not wish to have Indian food at Spice Grill can happily opt for choices from soup, salad, appetizer and main course to dessert in the Western menu. Start with mushroom soup with truffle oil and end with a stylish presentation of L’opera cake or Blueberry Roasted Pear, each served with a side of vanilla gelato. Popular main course items include “Oh My Cod,” a chunk of grilled cod fish with mashed potato, stuffed mushrooms and a side of vegetables and “Beef Rossini,” a tender cut of Wagyu beef topped with foie gras served with a side of three distinctive sauces and vegetables. North and South Indian cuisine are clearly indicated in the Indian menu and you may also enjoy some specialties that are popular in the state of Kerala. The chefs are handpicked from Ranisai, a village near Kolkata where families are renowned for their culinary skills, and here the chefs are given the opportunity to impress the clientele. For instance, the Dum Chicken Briyani at Spice Grill is complemented by three sauces: traditional raita, a brinjal-based sauce and a special Spice Grill sauce, that are unique to this restaurant. If you prefer freshly baked Indian breads instead of rice, you can try the Laccha Paratha, a wheat bread, and the Kuberri Kulcha bread topped with chopped almonds, cashew nuts, sesame seeds, raisins and bits of red and green cherries. Pick from a range of gravies like Gosht (lamb) Vindaloo, Pulicha Keerai Chicken, Lamb Mappas, Egg Curry and Kolkata Spicy Fish Curry, and you will surely wipe up every delectable drop of the gravy with repeat orders of the freshly baked breads. Then end your meal sweetly with traditional Indian desserts with a modern twist like their serving of Gulab Jamun with vanilla gelato! Spice Grill is at Lot B1, Ground floor of Little Red Cube, Persiaran Puteri Selatan, Puteri Harbour, Nusajaya, 81300 Johor Baru. Convenient parking spaces are located at the Puteri Harbour carpark (outdoor) or The Little Red Cube (indoor). Open daily from 12pm to 10pm with the bar open till 1am. For reservations, Tel: 6019 – 745 7788. Surrounded by national tragedies, there is no better way to describe the start of new year 2015, but somber. I stand in solidarity with the nation, sharing the grief for personal losses among those affected by the widespread floods and shocking air disasters that have inevitably touched our lives. While the year-end usually spells a time of celebration, rest and relaxation, these pleasures just seem inappropriate in light of the magnitude of suffering that so many are going through. I fully empathize with them and continue to pray for relief and comfort. Once again, we are reminded of how fragile life is and how we should never take our loved ones for granted. At the same time, we must take responsibility for contributing to global warming and consider possible reasons like poor drainage and poor maintenance of waterways that may have aggravated the massive floods in some areas. Closer to home, our family also had an unusual end to our year. Our 102-year old grandma suffered a bad fall that resulted in a hairline crack on her thigh bone. The shock to her old body has taken a toll on her and in the following weeks, her general condition deteriorated drastically. Nothing more can be done for her and on the doctor’s advice, we are keeping her comfortable with palliative care with the help of a day nurse at home. This grave turn of events added to the solemn situation and as days passed, I knew that one of my mum’s deepest desires was to go to see her mother again. We were in constant contact with Aunty Polly, who is caring for grandma in her home in USJ, to share the events as they develop around grandma and give her the necessary support. While I was also keen to be with grandma, dad’s general health was also unstable recently and he may not be up to making a trip. So I had to find the right opportunity to broach the subject and seek my parents’ views on what they wanted to do. Dad is grandma’s first son-in-law. I remember years ago when I invited gran to come to stay with us, she was happy to accept but considerate enough to seek dad’s approval before moving in. At that time, grandma was living alone in nearby Melodies Gardens but there was really no point in going home to an empty house when she was spending a great deal of time with us. Grandma was my room-mate for several years until my brother got married and moved to his own place, and I shifted into his room for grandma to have my room to herself. I will always associate jasmine flowers with grandma as she often wore them on her neatly combed hair, tucked inside a hair net. So each time I smell this fresh fragrance, I will think of her. She lived with us for almost 20 years and since September 2007, she was with Aunty Polly and her family in USJ. From old photos, I saw that grandma was very much part of our lives as she appeared in photos taken at home, at events and at our holidays in Singapore, Ipoh and Cameron Highlands. We can’t deny the fact that dad got on well with his mother-in-law from the start and later in life, after she was widowed, grandma was still welcome in our home. In the same way, grandma’s fourth son-in-law graciously opened his home in USJ to her. On December 30 we left JB in cool and cloudy weather for a smooth drive to USJ and returned safely the next day, the last day of 2014. Our brief time with grandma in USJ was both emotional and encouraging. While it was sad to see grandma looking so frail and helpless, it was priceless to have contact with her again. It was also very sad that grandma was not responsive enough to acknowledge the good news about the latest addition to the family. The birth of baby Vivienne, my eldest sister’s first grandchild on December 22, changed all our ranks and raised grandma’s rank to that of a lofty great-great-grandmother with the arrival of her first great-great-grand-daughter! It was bittersweet to see grandma lying down in a room where its walls are adorned by numerous newspaper articles I wrote about her. She may not be aware but she is a celebrity in her own right, not just the mother of badminton champions but the Real Champion! We also met with the doctor again and her advice was both practical and positive. We continue to keep grandma comfortable as her 102-year old system struggles to cope with the trauma she suffered. It was painful to see her slipping away but we take comfort that we have always been doing our best for grandma. On the last night of 2014, we joined the church for our annual Watchnight service where we reviewed the year that had passed and spent time together in prayer. There is no better way to close the year than to share a meaningful time in reflections on our blessings and failings, with a renewal of commitment to achieve various goals next year. As we look to the start of 2015, we do not know what the year ahead will be but we are assured that it will turn out for our good. 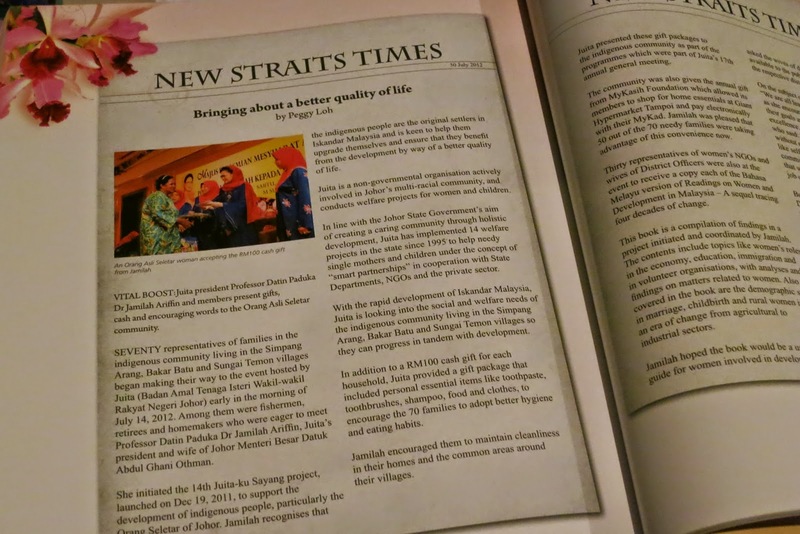 On the left, bottom corner of the December 31 issue of Streets Johor, there was an announcement that Streets will cease publication with effect from that day. Even though it was printed with a bright orange coloured background, readers who are too familiar with this Southern section of the New Straits Times may have overlooked it. So on 1 January 2015, many readers who looked through their fresh copy of NST, in search of their staple section of the newspaper were disappointed when they failed to find it! 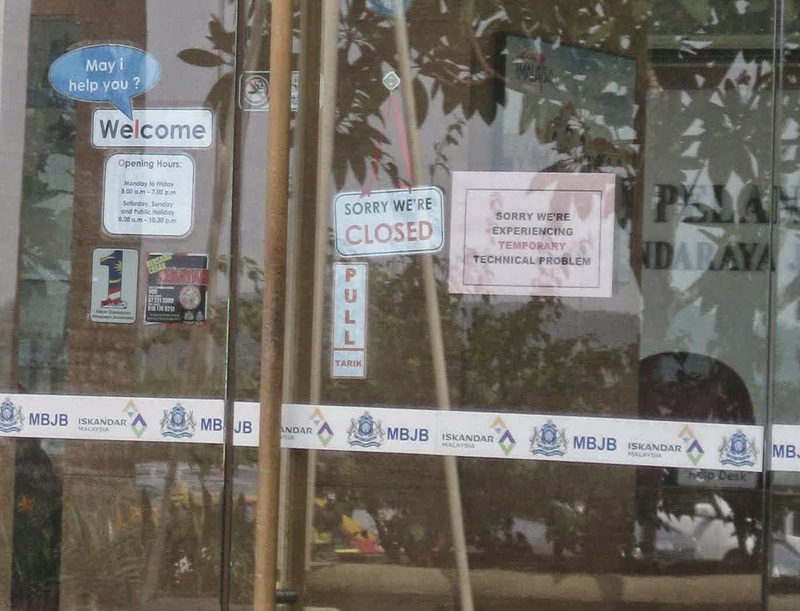 Streets Johor started seven years ago as a pull-out section called, Johor Buzz or JB, in short. The name was then changed to Johor Streets and later changed to Streets Johor. Over the years, I learnt that many readers have grown to enjoy the various segments of this 8-page section particularly because it contained local news and stories that were relevant to them. Some admitted that when they opened the daily newspapers, they first reached for the Streets section to scan for anything interesting happening in Johor Baru. It was my privilege to contribute to Streets on a regular basis and I’m grateful for the opportunity to share Johor stories with readers. From news, events to food reviews, I had a great deal of fun meeting with organizers, participants, merchants, VIPs and a host of interesting people, to write exciting stories to inform and interest readers. The most rewarding part of writing about something is the positive impact on the community, the awareness it created and the encouragement it gave to the event organizers or individuals. Of course, I also got to sample a wide range of good food when I do food reviews but it’s also my responsibility to tell the merchant honestly if his food is not up to the mark and tactfully tell him to get it right before I can write about it! I was privileged to work closely with the former president of Juita, the Johor state NGO that was then headed by Professor Jamilah Ariffin, and covered a number of major events organised to improve the livelihood of single mothers, rehabilitate special children and uplift the lives of aboriginal people in Johor. As a sociologist, Prof Jamilah published several books and I’m pleased that some of my articles published in Streets Johor have been quoted in her book, The Professor and the Juita NGO – Smart partnership in social welfare work. Two of my centerspreads on the dragon dancers on stilts! 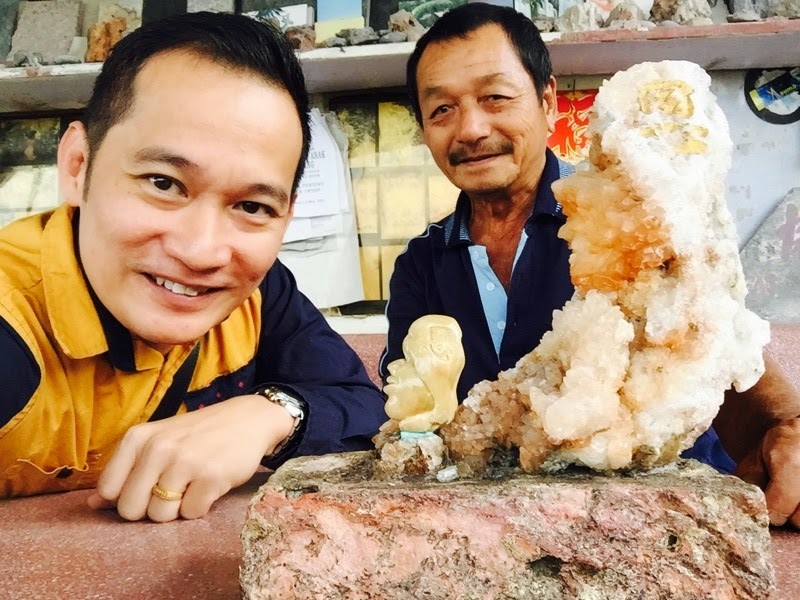 I remember first writing about the Johor Ancient Temple or Gu Miao for Travel Times (the former name of Life & Times Travel) and when the story was rewritten and published in Johor Buzz in 2009, the Chinese community leaders in JB were absolutely thrilled. Up to that time, news on the temple was only written by the Chinese media and my story gave English readers the opportunity to learn more about this pride of Chinese heritage in JB. I must confess that my command of the Chinese language is limited but I still accepted the challenge to dig out stories from non-English-speaking people using my smattering of broken Mandarin. Such painstaking effort paid off handsomely when my stories were published in English language for readers to learn more about Chinese culture on Teochew opera performers, the lion-dance lion head-making sifu, dragon-dancers on stilts and the unique race challenge for big-headed dolls! When I joined the participants at their first-of-its-kind race for big-headed dolls, the organizers, a troop of skilled stilt-walkers, had an exhibition of some of the elaborate costumes and equipment used in performances abroad. Besides taking part in games and fun activities like trying to walk on stilts, visitors could buy souvenirs at that event. They also displayed some newspaper publications on their past events and I was delighted to see among them, not one but two of my centerspread articles on the dragon-dancers on stilts! Last May, I wrote about the Goodwill Walk 2014 from Singapore to Malacca that was led by Rishiwant Singh, popularly known as the Flying Singh, a RTM radio and TV personality. He is also the Humanitarian Aid Coordinator for the Asia Pacific Region of the United Sikhs. The youngest student who completed about 55km from Muar to Malacca was his daughter, Standard 6 student, Sarasvati Kaur from SRJKC Chung Hwa 1B who turned 12 on her birthday on June 10. After my story was published in Streets, Rishiwant told me that the Sikh community was absolutely thrilled with it and Sarasvati was so happy that she preserved my centerspread article in a poster! No matter how long I have been published, I will never get tired of seeing my stories in print and how they are proudly exhibited or treasured by individuals. I remember going to visit Ms Amy Wong, one of our former school teachers, with a group of classmates for afternoon tea. Ms Wong was among the pioneer group of Malaysians who was trained at Kirkby College in the UK and given the moniker as a “pillar of the JB Convent” because she completed her education here as well as retired from her career in teaching here too! And in her dining room, I saw how my story on her was proudly displayed in a simple poster! In November, I joined the Social Development team of Iskandar Regional Development Authority (IRDA) in their event where primary school teams presented their ideas in the second Iskandar Malaysia Eco Life Challenge. Several guests from Japan, including representatives from KIKO Network, a Kyoto-based NGO, the City of Kyoto Global Environment Policy Office Environment Policy Bureau and a Junior Research Associate with the National Institute for Environmental Studies, were also present. It was an exciting and informative challenge as the winning team was rewarded with a study trip to Kyoto, Japan. My article was published on Nov 12 when the Japanese visitors were still here and I was told that they were not only thrilled with it but bought copies to take home to Kyoto! being discussed in that meeting in Kyoto! Just as I graciously accepted his “Thanks”, I echo my grateful “Thanks” to Streets Johor for giving me the opportunity to share so many stories with readers. While Streets no longer exist now, I’m pleased that most of my stories published in Streets Johor are safely stored in My Johor Stories under Recently Published and as blog posts in various categories. Happy New Year 2015 and Happy Reading! Within the first few days of 2015, I started to receive invitations to events and food tastings and follow-ups on projects that were discussed late last year. These I had to politely decline because there is no longer an avenue to publish the stories. It’s a sad shame because there is still a great deal happening in Johor Baru and now I cannot share the happenings and events with readers! A friend, who obviously missed the notice on Streets, told me that every day he searched through the copy of NST for Streets Johor but in vain. He got rather riled up with the delivery guy because he suspected that he must have carelessly misplaced the Streets section in his daily delivery! In fact, he was so upset that he was going to give his delivery guy a scolding for missing out the Streets section every day. Then we met and I clarified the situation with him. I’m just glad I saved that delivery guy a scolding! Today I received a call from a reader who has a subscription for NST specifically to read local news in Streets Johor. She too discovered that Streets was missing for days and thought that a phone call to me should solve the mystery of the missing Streets Johor. When I explained the situation to her, she was very sad. The worse reaction from her was a decision to cancel her subscription because the Streets section has ceased to exist! I can understand that it is quite a shock for regular readers who are now suffering from withdrawal symptoms in the absence of their daily staple read in Streets Johor. While it’s all very sad, the silver lining in this dark cloud is how many readers are also missing Streets for my stories.